I’ve noticed there are two kinds of people who can talk about poop without so much as batting an eye: moms and horse owners. And since I belong to both of these clubs, I have no problem whatsoever with the P-word. The truth is, nobody deals with poop more than us horse people—am I right? After all, the average horse produces around 40 pounds of manure per day, much of which we find ourselves picking up from stalls or pens. But as a health-conscious horse person, I’ve learned that my horses’ manure can actually tell me quite a bit about their current state of health. So I’ve become somewhat versed in the science of horse poop-ology—always paying attention to those extra-large droppings whenever I spot them. There’s really no such thing as normal horse poop. What I mean by this is every horse’s poop may be slightly different. This is partly because of varied diets, but is also simply because every horse is an individual. But as horse owners, we need to determine what is normal for each of our particular horses. This way, we’ll be able to spot a change when we see it. To know what’s normal for your horse, take note of the color, consistency, size, and general appearance of his manure. Also, if you can, pay attention to the frequency with which he defecates. A change in any one of these factors is a signal that something may be amiss. Dry, hard, smaller than normal, or mucous-covered manure usually indicates constipation. And we all know that constipation in horses usually means colic. If you notice this type of change in your horse’s manure, be on high alert and you may very well want to go ahead and get your vet involved. Loose or wet manure can have multiple causes, including stress, recent diet changes, or can be the result of eating new spring grass. Antibiotics and even long-term NSAID use (such as bute) can also cause loose stools. If the loose stools are short-lived, it’s usually not a major cause for concern, but if they continue, the issue needs further investigation. Diarrhea or extremely liquidy manure, on the other hand, is never normal and should be cause for concern. It can be associated with infection, illness, or eating toxic plants. Therefore, getting your vet involved ASAP is recommended. 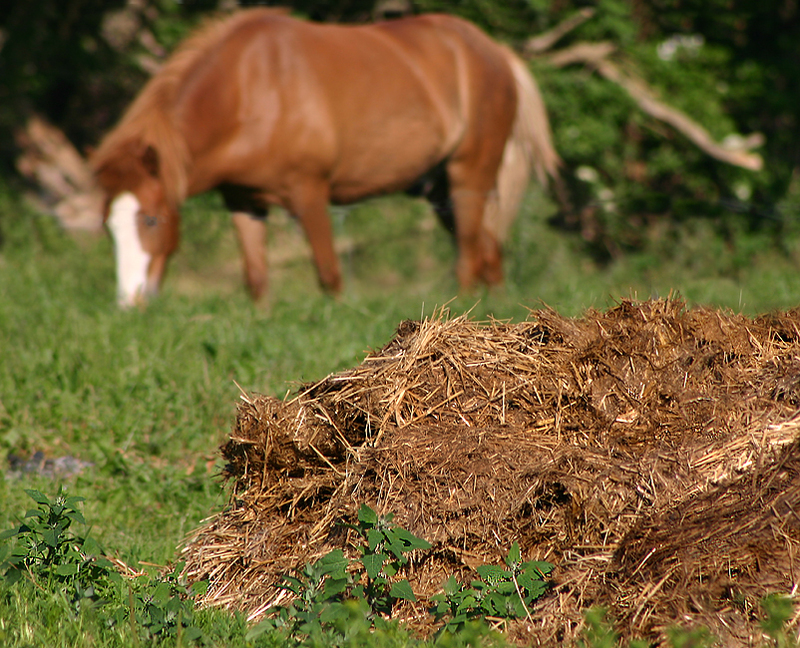 Depending on the horse’s diet, manure can come varying shades of brown to green. Horses eating beet pulp may even have reddish-brown poop. But two colors which signal trouble include red and black, both of which can be caused from internal bleeding. 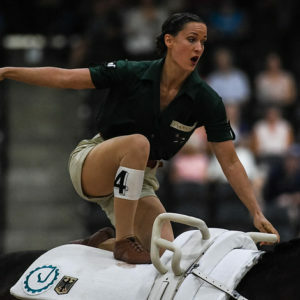 If you see worms in your horse’s poop, this is obviously not a good sign. But if this is the case, your horse needs to be dewormed! Large or undigested feed particles in manure is more common with older horses, but may also indicate dental issues. If you notice this problem, have your horse’s teeth checked. If your horse’s poop has a gritty appearance, this is indicative of sand ingestion (which can also lead to serious health problems). Ask your vet for suggestions on treating ASAP. On the bright side, you don’t have to attend two or even four years of college to become a horse poop-ologist. All you have to do is pay attention and maybe do a little research. Just remember to always call your vet (who actually does have a PhD in horse poop-ology) if you observe any changes you’re not comfortable with. Content on this site is not intended to be a substitute for professional medical advice, diagnosis, or treatment. Always seek the advice of your veterinarian or other qualified health provider with any questions you may have regarding your horse’s health.